Chances are you landed on this page because you’re thinking about upgrading from your current drivetrain to SRAM Eagle and you might have a few questions. Will SRAM Eagle work on my bike? Is it even worth the money? Or maybe you have decided to pull the trigger but want to know what the difference is between NX, GX, X01, and XX1. The good thing is we have a ton of knowledge around all of this already and can help you make the right decision. To start, you can check out the video above which outlines all four SRAM Eagle drivetrains. When you are ready to purchase, we have plenty of different options in stock and ready to ship! We help riders every day upgrade to SRAM Eagle and know a thing or two when it comes down to helping you choose the right components. If you'd like to learn a little more about the different drivetrains the make up the SRAM Eagle family, check them out below. SRAM’s NX Eagle group is aimed at riders looking to convert from 2x10, 2x11 or an entry level 11 speed drivetrain and still have a splined freehub. While this is SRAM's lowest price point for Eagle, we wouldn't consider this to have entry-level performance. As you would expect from SRAM, shifting is as clean and precise as the other Eagle groups, giving it a high end feel while not putting a massive black hole in your bank account. The nice thing about the NX drivetrain is that it’s affordable to upgrade to. 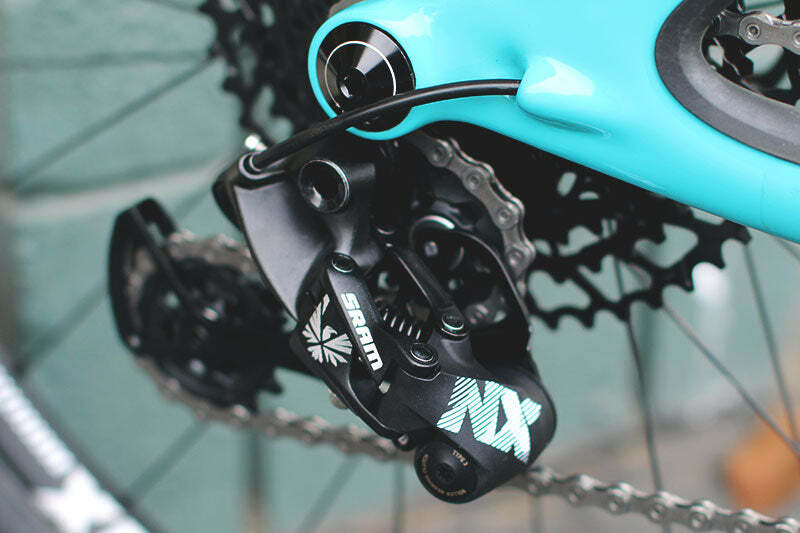 It opens the possibility of a 12 speed drivetrain to a lot more bikes with its cassette, or will make that stock bike you’ve been looking at a bit more enticing now that it comes with NX 12 speed for a low price. Riders complaining that upgrading to Eagle was too expensive no longer have to worry about cost. If you have any questions about this drivetrain, then shoot us a message! We love answering questions, but we’re also here to build relationships with other riders because at the end of the day, we’re all in it for the same thing - we just like to have fun on our bikes. Be sure to check out our huge selection of SRAM NX Eagle drivetrain and components. The SRAM’s GX Eagle groupset is the workhorse of the Eagle family. Durable enough to live on every bike, performance high enough to belong on every build, with looks nice enough to set your bike apart from your riding buddies. The GX Eagle cassette is made from 12 individual steel cogs that are then pinned together. This helps keep the price down and performance up. The rest of the group is as you would expect from SRAM: great quality and a great performer. If you're someone who struggles on climbs, then upgrading to SRAM Eagle is a no brainer. 12 speed drivetrains are becoming the standard spec on all bikes and really are the drivetrain of the future. So why buy from us? Simple. Superior knowledge and phenomenal customer service - not to mention great follow up emails that will have you laughing all the way down the trail. Click through below to see what SRAM GX Eagle drivetrains we have available for purchase. We offer fast and free shipping on ALL orders in the US so you can have your bike upgraded in no time. With the X01 drivetrain, were getting into the higher price point of the Eagle family and while all Eagle systems perform great, the X01 setup pays a little more attention to the components in this groupset and is significantly lighter than the GX option. A lot of weight reduction is in the cassette, as the X01 cassette is machined from an aluminum block and then pinned to the largest 50t cog. This reduces weight dramatically as the entire middle of the cassette is hollow. Also, since it is machined, the shift ramps and tooth profiles are more precise, resulting in buttery smooth shifting performance. While this isn't the highest end of the Eagle family, we don't think anyone would be disappointed if this is as good as it got. If this is your first time to our site, rest assured, we ship thousands of orders every month to die hard riders like yourself. We eat, sleep, and breathe MTB and want you to have the best bike possible. Check out all of our SRAM X01 Eagle options by clicking the button below! 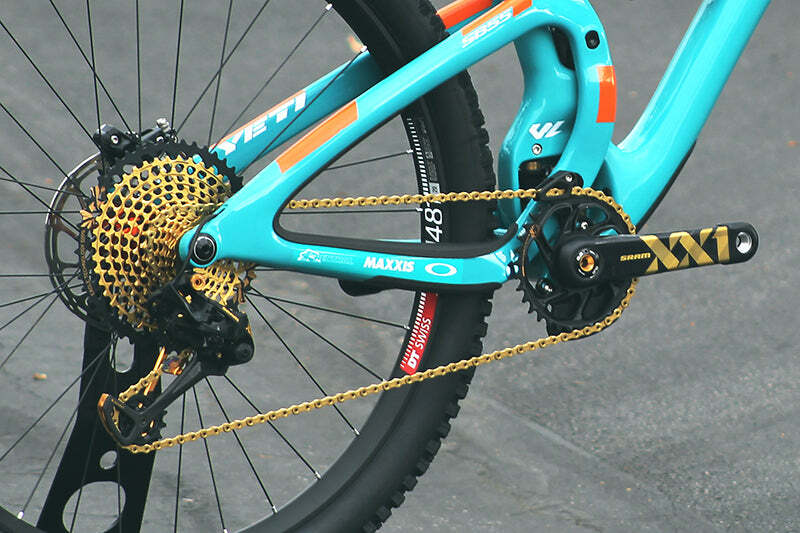 You can't miss this drivetrain, with a gold cassette, a gold chain and gold accents on all the other parts, you are at the highest end of Eagle. 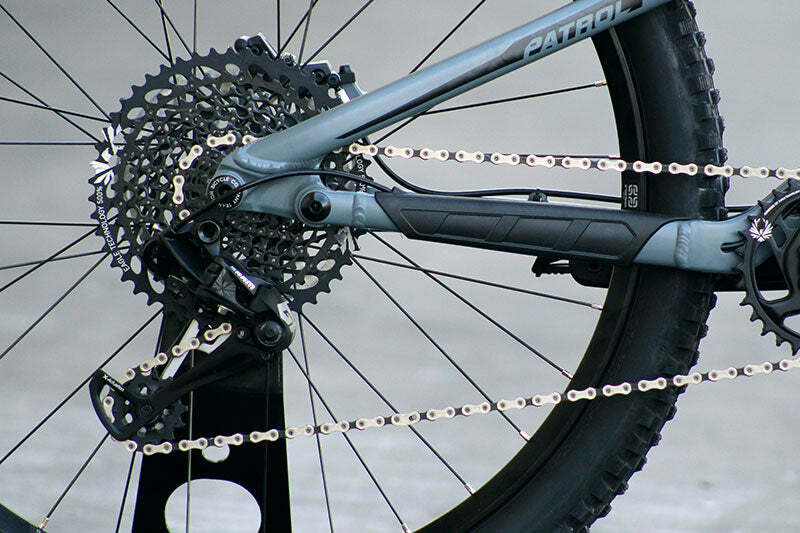 The XX1 drivetrain shares some traits from the X01 Eagle drivetrain, but there are some differences. The shifter gets a bit lighter, and has a carbon shifter cover as well as a carbon shift lever. The rear derailleur also gets a carbon cage. The cassette is technically the same as far as materials and function go on the X01, but it gets a gold treatment. Surprisingly, the gold does not wear off, and even with thousands of miles logged, it will still be as great looking as day one. The chain also gets a bit better finishing treatment and is available in gold or black. If you are looking to make a flashy bike, or even just have the highest end parts on your bike, XX1 Eagle will not let you down. We've mentioned we're pretty knowledgeable about bikes, but be sure to check out all the positive reviews from our customers. We're not trying to brag here, but our reviews simply dominate all of our competitors out there and that alone speaks for itself. A question we often receive is: Will this 12 speed drivetrain fit on my bike? Check out this video where we discuss in detail EXACTLY what you need to get your bike fitted with the SRAM Eagle drivetrain of your choice.